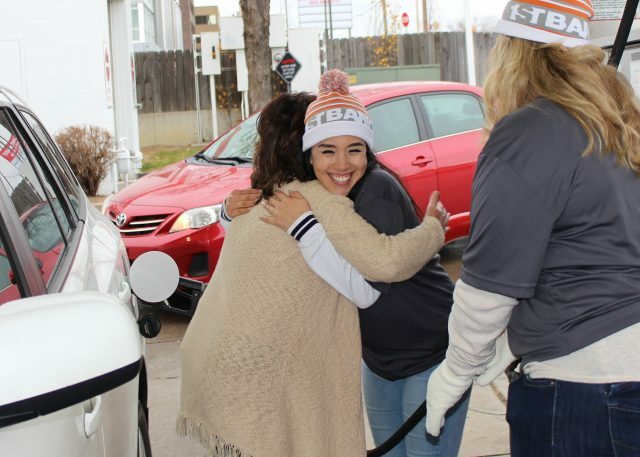 It took three days, six gas stations and 60 employees to surprise more than 500 Coloradans across the state — all in an effort to encourage giving back. Before Thanksgiving. FirstBank partnered with fuel stations in Denver, Boulder, Summit County, Greeley/Evans and Colorado Springs, and pumped free fuel for hundreds of unexpected commuters across the state to encourage “giving it forward” to a charity of their choice on Colorado Gives Day (Dec. 5, 2017). In total, we covered over $16,000 worth of gas bills at the pump in hopes these acts of kindness will inspire more Coloradans to give back to causes and communities that need it. This is the fourth year FirstBank has done its “Give It Forward” campaign (formerly known as “Pay It Forward”) to encourage donations for Colorado Gives Day. Last year, FirstBank executives and officers disguised themselves as grocery store baggers and surprised more than 100 unsuspecting shoppers with free groceries. Don’t forget to give back to causes you care about on Colorado Gives Day by donating at coloradogives.org. When you do, be sure to use the promo code GIVEITFORWARD during checkout so we can continue doing more programs like this.